Kuddus M, Ginawi IA, Al-Hazimi A (2013) Cannabis sativa: An ancient wild edible plant of India. Emirates Journal of Food and Agriculture 25: 736. Tariq A. L., & Reyaz AL (2013) Antioxidant activity of Camellia sinensis leaves. Int. J. Curr. Microbiol. App. Sci 2: 40-46. Sarangi MK, Padhi S (2014) Plants with potential anticancer activities-a Review. International Journal of Phytomedicine 6- 01. Tariq AL (2016) Preliminary Phytochemical Screening and Anti angiogenesis Studies of Different Extracts of Curcuma amada. Int. J. Curr. Microbiol. App. Sci 5:109-117. Jyotshna IPS (2013) Pharmaceutical standardization of Indigenous traditional medicine: Dhatri lauh. 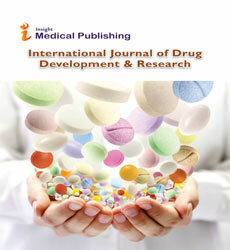 International Journal of Drug Development and Research. Nanjwade VK, Manvi FV (2012) Development and characterization of novel pharmaceutical crystalline complex of lomefloxacin. International Journal of Drug Development and Research. Khalil, RM, Abdelbary GA., Basha M. Awad GE, el-Hashemy HA (2016) Enhancement of lomefloxacin Hcl ocular efficacy via niosomal encapsulation: in vitro characterization and in vivo evaluation. Journal of liposome research,1:12. Chakraborty S, Mittal A, Banerjee D (2016) Human Recombinant Insulin in Supraphysiological Concentration Support Bacterial Growth in Glucose Independent Manner. International Journal of Drug Development and Research. Aswar MK,Patil VR (2016) A systematic review on neuropathy. International Journal of Drug Development and Research. Chen Y, Wu Y, Gan X, Liu K, Lv X, et al. (2016) Iridoid glycoside from Cornus officinalis ameliorated diabetes mellitus-induced testicular damage in male rats: Involvement of suppression of the AGEs/RAGE/p38 MAPK signaling pathway. Journal of Ethnopharmacology 194: 850-860. Rattan R, Inder Fozdar B, Gautam V, Sharma R, Kumar D, et al. (2016) Cuspidate A, new anti-fungal triterpenoid saponin from Lepidagathis cuspidata. Natural product research 1-7. Mehmood Y, Saleem N, Syed MA, Hanif S (2017) Application of UV spectrophotometric method for easy and rapid estimation of sulfasalazine in pharmaceutical formulation (suspension). Pharmaceutical Methods 8. Rao PS, Mounica E, Roja S, Venkatesh K, Suthakaran R (2016) FORMULATION AND EVALUTION OF MOUTH DISSOLVING TABLETS OF MEMANTINE HYDROCHLORIDE. Indo American Journal of Pharmaceutical Research 6: 5766-5773. Ashrafzadeh F, Tohidi H, Ataei Nakhaei A (2017) Iranian Medicinal Plants and Intractable Epilepsy in Childhood (A narrative review). Reviews in Clinical Medicine. Durisova M (2016) Mathematical modeling formation of 7-hydroxymethotrexate from methotrexate in patients undergoing treatment for psoriasis with methotrexate. J Drug Metab Toxicol 7: 2. Janero DR (2016) The reproducibility issue and preclinical academic drug discovery: educational and institutional initiatives fostering translation success. Expert Opinion on Drug Discovery 11:835-842. Durisova M (2016) Mathematical modeling formation of 7-hydroxymethotrexate from methotrexate in patients undergoing treatment for psoriasis with methotrexate. J Drug Metab Toxicol 7:2.